Rick Santelli Converts Pickup to Run on Natural Gas: From Start to Finish. One of my passions is investing. I rarely watch ESPN; instead CNBC is constantly on my TV. While I do enjoy some of the morning radio guys in the Twin Cities, I’ve been around sports enough if I really want to know something I can just call a contact and find out. Sports is a business. While I respect the athletic abilities of those I watch — and some are truly amazing — there’s no fascination left for me. If you’re tired of paying close to four bucks a gallon — or if you’re in California $5 per gallon — good news. Competition to gasoline is close at hand: liquid natural gas. I learned this last summer, and the momentum has increased since. The reason is simple: With the price of oil hovering around $100 a barrel and the fact that it comes from countries who are hostile to the West (and lots of other parts of the world), it only makes sense to look at alternatives. Europe is further ahead than we are in North America at adapting to natural gas. In Europe, natural gas cars made by the likes of General Motors are on the road. Our side of the Atlantic we may be catching up. The game changer will be what’s know as surface fleet fleet vehicles — your Fed Ex trucks, UPS trucks, the garbage trucks, trucking companies, etc. They want a fuel that is cheaper than diesel. Natural gas fits the bill because it’s cheaper and just as dependable as the fuels derived from oil. Plus, if you’re into the green thing, they it has less carbon emissions. Waste Management (WM) now has 1,400 trucks that run on natural gas. Of course, there are those who raise the question, “Well, what happens if natural gas up in price?” Natural gas has a natural price hedge that oil doesn’t have: your local garbage dump. That stuff can be burned and turned into methane which, in turn, can be converted into natural gas. 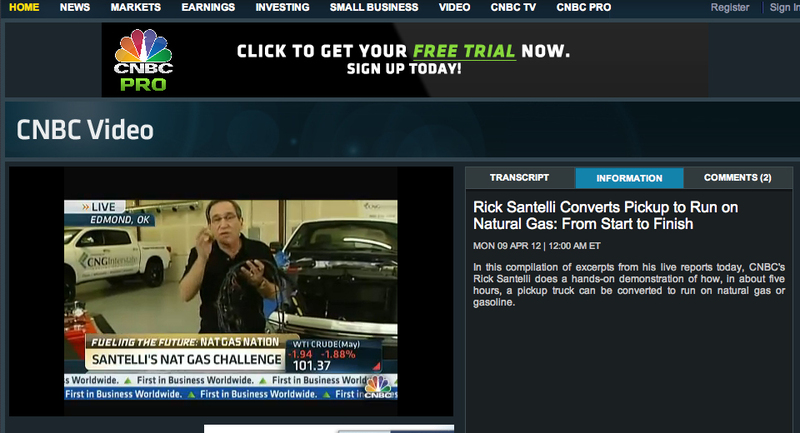 Rick Santelli just converted his truck into a LNG (liquid natural gas)-powered vehicle for CNBC. The conversion cost him, but once the surface vehicles start using natural gas en masse the passenger cars will become more prevelent as well. Where would one gas up? The gas station. Pilot Flying J truck stops, in cooperation with a company called Clean Energy Fuels Energy (CLNE), is building LNG pumps at their stations across the country. 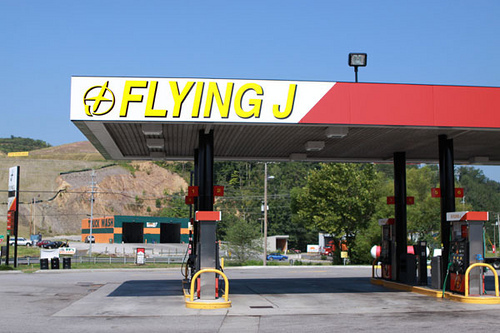 By the end of 2013, you’ll be able to go coast-to-coast and fill up at a Flying J. And that’s just the beginning. We are still in the infancy in this, but unless Washington screws it up, bet on it happening. Can’t wait to pay less than two bucks a gallon to fill up.